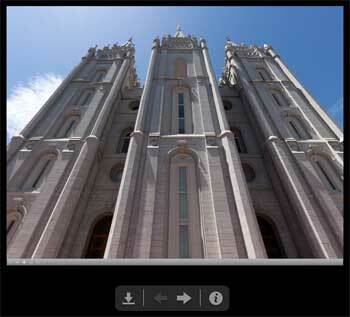 360° panoramas of Temple Square let you look around as if you were there. Dr. William Hamblin has put together some very cool high resolution 360° panoramas of different locations on Temple Square in Salt Lake City. And they really are 360°. You can look in all different directions, including up and down. It gives the impression of standing on the spot. Well done! You get the best effect if you zoom in just a little. You can zoom in and out by using the shift and Ctrl keys on your keyboard. You can move around by clicking and dragging with your mouse. I’ve always been impressed by how new technologies can take us places for fun or practical purposes. I’ve written about visiting Utah temples with Google Street View, modeling temples in 3D with Google’s Sketchup, using Microsoft’s Photosynth technology to virtually zoom around Temple Square, or how the Church uses computer rendering to envision future temples. Dr. Hamblin’s panoramas are a welcome addition!